BAGRAM AIR FIELD, Afghanistan â€” Anyone who thinks the United States is really going to withdraw from Afghanistan in July 2011 needs to come to this giant air base an hour away from Kabul. Thereâ€™s construction everywhere. Itâ€™s exactly what you wouldnâ€™t expect from a transient presence. Step off a C-17 cargo plane, as I did very early Friday morning, and you see a flight line packed with planes. When I was last here two years ago, helicopters crowded the runways and fixed-wing aircraft were â€“- well, if not rare, still a notable sight. Today youâ€™ve got C-17s, Predators, F-16s, F-15s, MC-12 passenger planes â€¦ I didnâ€™t see any of the C-130 cargo craft, but theyâ€™re here somewhere. More notable than the overstuffed runways is the over-driven road. Disney Drive, the main thoroughfare that rings the eight-square-mile base, used to feature pedestrians with reflective sashes over their PT uniforms carrying Styrofoam boxes of leftovers out of the mess halls. And those guys are still there. But now the western part of Disney is a two-lane parking lot of Humvees, flamboyant cargo big-rigs from Pakistan known as jingle trucks, yellow DHL shipping vans, contractor vehicles and mud-caked flatbeds. If the Navy could figure out a way to bring a littoral-combat ship to a landlocked country, it would idle on Disney. Expect to wait an eternity if you want to pull out onto the road. Cross the street at your own risk. Then there are all the new facilities. 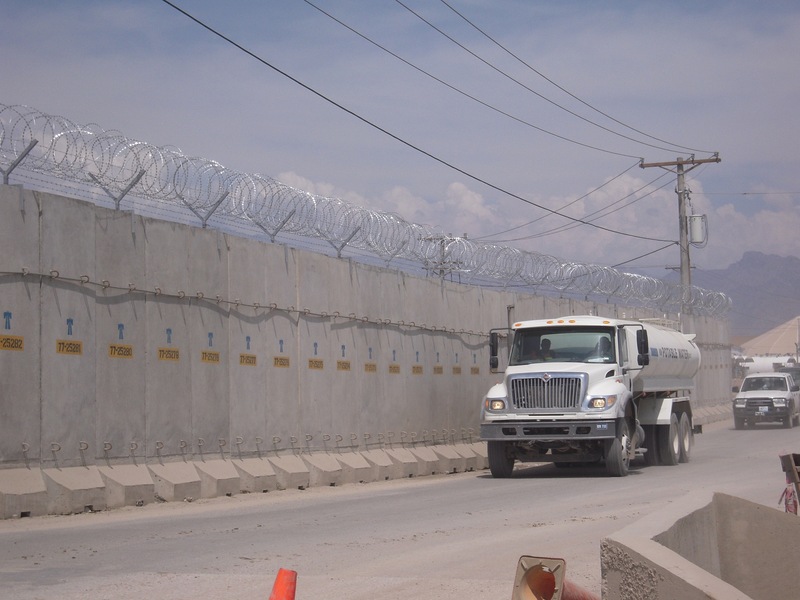 West Disney has a fresh coat of cement â€“- something thatâ€™s easy to come by, now that the Turkish firm Yukcel manufactures cement right inside Bagramâ€™s walls. There on the flightline: the skeletons of new hangars. New towers with particleboard for terraces. A skyline of cranes. The omnipresent plastic banner on a girder-and-cement seedling advertising a new project built by cut-rate labor paid by Inglett and Stubbs International. I havenâ€™t been able to learn yet how much it all cost, but Bagram is starting to feel like a dynamic exurb before the housing bubble burst. There was actually a traffic jam this afternoon on the southern side of the base, owing to construction-imposed bottlenecks, something I didnâ€™t think possible in late summer 2008. Perhaps the most conspicuous change of all: fresh concrete T-walls fortifying the northern and southern faces of the base. Insurgents have launched a number of futile attacks on the base recently, mostly inaccurate small-arms fire and the odd rocket-propelled grenade. Theyâ€™ve mostly irritated their targets instead of killing them. But a definite legacy is the abundance of huge barriers at the most-obvious access points to Bagram. Much of the eastern wing remains surrounded by chicken fencing topped with barbed wire, but the more sensitive points of entry are now hardened. So, apparently, are the sentiments of local Afghans nearby. Troops here told me of shepherd boys scowling their way around Bagramâ€™s outskirts, slingshotting off the occasional rock in hopes of braining an American. Again, something else I wouldnâ€™t have believed two years ago. By next year, the detention facility thatâ€™s spirited away on a far corner of Bagram is supposed to revert to Afghan control. And maybe someday the Afghan National Army will inherit the entire base. But two years ago there were about 18,000 troops and contractors living here. Now that figure is north of 30,000, all for a logistics hub and command post that the United States didnâ€™t ever imagine possessing before 9/11. In 2011, the U.S. military probably wonâ€™t be thinking about turning over the keys to a new, huge base. Itâ€™ll be thinking about how it can finish up the construction contracts it signed months ago -â€“ if not some itâ€™s yet to ink.